AkroMARK Plus™ is a multiple color and multiple shape hot stamp marking system designed to provide accurate tire marking associated with final finish testing. This product is capable of tire marking on a variety of tires, ranging from low profile passenger tires to medium truck tires. AkroMARK Plus™ is designed to operate within the range of tire sizes tested by either the Micro-Poise ASTEC® PLUS Uniformity Machine, ASTEC® FX or AkroDYNE® Dynamic Balance machine and AkroDYNE® FX. This includes tests performed on passenger, light truck and medium truck tires. The marking head assembly may be installed individually on an external exit station in either an upper or lower marking arrangement, or as a pair of markers on the same exit station. Designed to meet Micro-Poise's Modular Tire Measurement Systems (MTMS) comprehensive final finish marking requirements, AkroMARK Plus yields NO CYCLE TIME INCREASE when installed with an MTMS final finish line. 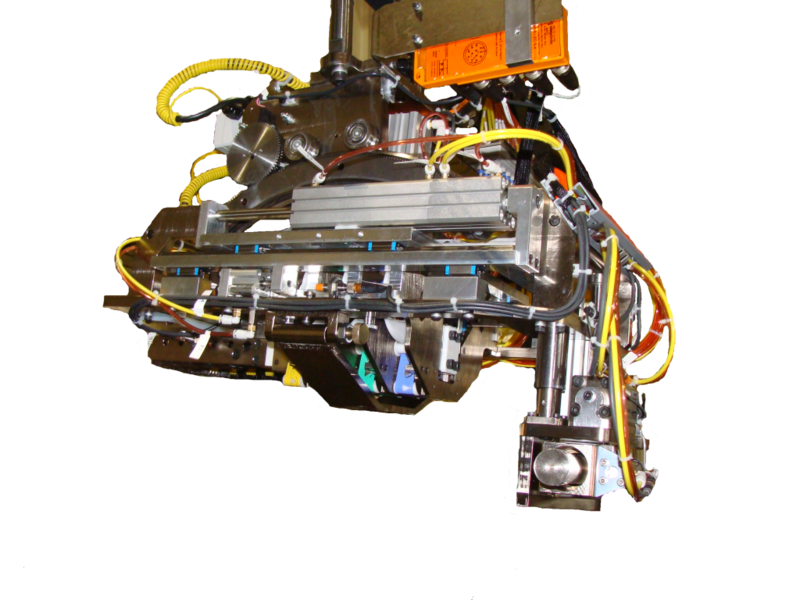 QUICK MAINTENANCE is a key feature designed into the unique print head. AkroMARK Plus™ fits on the exit station for the ASTEC® PLUS tire uniformity machine or the AkroDYNE® dynamic balance machine and is fully integrated with each system. AkroMARK Plus™ can be retrofitted and integrated into other manufacturers tire testing lines. AkroMARK Plus™ produces a high grade permanent foil mark required of OE tire manufacturers to meet their discerning customer requirements. Tire marking is used to identify tire testing results for uniformity, dynamic balance and other final finish tests. Marks may be used to identify tire grade, high or low points of radial force variation, or other specific measurements. Up to SIX PINS with varying shapes and up to FOUR COLORS in tape cartridges provide the final finish test engineer with the flexibility to select multiple combinations of colors and marks when grading tires. Designed-in quick change capability yields less downtime for tape replacements. Individual tape advancement provides longer tape life per color. In addition to the basic marking shapes provided, custom marks are available and can be installed as part of the six pin configuration. Designed to work with Micro-Poise’s Modular Tire Measurement System (MTMS) and MTMS FX – allowing for one mark station to support an integrated final finish line. Standard colors of red, yellow, white or green. Standard pins with color selection provides for up to 256 possible marking combinations. Customer marking pins and alternative color cartridges are available. Can be installed to work with any manufacturers external mark station, supporting all final finish marking requirements.